18 Gramos - Masdardos S.L.U. 18 Gramos There are 150 products. XQ-MAX Vincent Van der Voort. 18 grs. Soft tip. 90% Tungsten 3 softip darts per set ø = 6,50mm L = 45mm Nylon shafts. Standard flights. XQ-MAX Pink Shadow 80%. 18 grs. Soft tip. 80% Tungsten 3 softip darts per set ø = 6,50mm L = 49,5mm Nylon shafts. Standard flights. XQ-MAX MVG Silver Brass. 18 grs. Soft tip. 3 softip darts per set ø = 8,0mm L = 50,8mm Nylon shafts. Standard MVG flights. 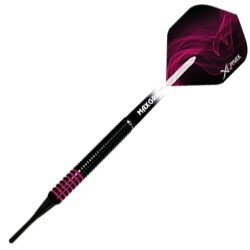 XQ-MAX MVG Mighty Generation 3. 18 grs. Soft tip. 90% Tungsten 3 softip darts per set ø = 6,43mm L = 45mm Nylon shafts. Standard MVG flights. XQ-MAX MVG Green Demolisher 70%. 18 grs. Soft tip. 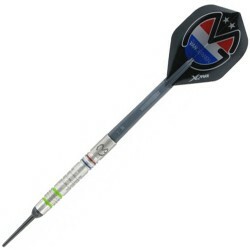 70% Tungsten 3 softip darts per set ø = 6,8mm L = 48mm Nylon shafts. Standard MVG flights. XQ-MAX MVG Double Career Slam Edition . 18 grs. Soft tip. 90% Tungsten 3 softip darts per set ø = 6,40mm L = 45mm Nylon shafts. Standard MVG flights. XQ-MAX MVG Brass. 18 grs. Soft tip. 3 softip darts per set ø = 8,0mm L = 52,4mm Nylon shafts. Standard MVG flights. XQ-MAX MVG 90% . 18 grs. Soft tip. 90% Tungsten 3 softip darts per set ø = 6,30mm L = 45mm Nylon shafts. Standard MVG flights. XQ-MAX Monsoon. 18 grs. Soft tip. 90% Tungsten 3 softip darts per set ø = 6,50mm L = 45mm Nylon shafts. Standard flights. XQ-MAX Mistral. 18 grs. Soft tip. 90% Tungsten 3 softip darts per set ø = 6,30mm L = 45mm Nylon shafts. Standard flights. XQ-MAX GIBLI. 18 grs. Soft tip. 90% Tungsten 3 softip darts per set ø = 6,60mm L = 50mm Nylon shafts. Standard flights. XQ-MAX BURAN. 18 grs. Soft tip. 90% Tungsten 3 softip darts per set ø = 6,50mm L = 50mm Nylon shafts. Standard flights. WINMAU OUTRAGE Brass Black 18gr Brass barrel. Standard flights. Nylon stems Length: 50,8mm Diameter: 8,00mm Weight 18 grs.